We present a comprehensive model that integrates virtues, values, character strengths and ethical decision making (EDM). We describe how a largely consequentialist ethical framework has dominated most EDM scholarship to date. 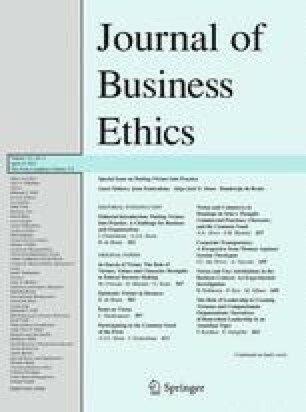 We suggest that reintroducing a virtue ethical perspective to existing EDM theories can help to illustrate deficiencies in existing decision-making models, and suggest that character strengths and motivational values can serve as natural bridges that link a virtue framework to EDM in organizations. In conjunction with the more fully formulated extant research on situational determinants, we present and discuss our model that introduces a virtue based orientation to EDM. We gratefully acknowledge the financial support of the Trudeau Foundation and the Ian O. Ihnatowycz Institute for Leadership at Richard Ivey School of Business, the insightful contributions of the practitioners in the “Leadership on Trial” study, as well as the insights provided by Jeffrey Gandz, Corey Mulvihill, Dusya Vera, editor Joan Fontrodona and the anonymous reviewers. Aristotle. In H. Rackham (Ed. ), Nicomachean ethics. Cambridge, MA: Harvard University Press. Accessed from http://www.perseus.tufts.edu/hopper/text?doc=Perseus:text:1999.01.0054. Accessed 21 Oct 2012. Homiak, M. (2007). Moral character. In Stanford encyclopedia of philosophy. Metaphysics Research Lab. Accessed from http://plato.stanford.edu/entries/moral-character/. Accessed 17 July 2010. Hursthouse, R. (2007). Virtue ethics. In Stanford encyclopedia of philosophy. Metaphysics Research Lab. Accessed from http://plato.stanford.edu/entries/ethics-virtue/. Accessed 18 July 2010.